Florida U.S. Sen. Marco Rubio talks to guests during the Hispanic Leadership Network in January. Yet another gem of a story about Flordia U.S. Sen. Marco Rubio’s family history has emerged: It now turns out that his maternal grandfather went through immigration hell in 1963 quite similar to what many undocumented people in the U.S. face. In fact, Rubio’s grandfather -- who had been a legal U.S. resident and then returned to Cuba because he saw possibilities in its new revolution before rushing back in disappointment with an expired residency card -- was scheduled for deportation before he was granted retroactive refugee status. The information wasn’t revealed by Rubio, who’s out stumping with all-but-certain GOP nominee Mitt Romney in what appears to be a VP try out. Rubio can’t seem to talk forthrightly about himself or his family. Step #1: He is spending big money to opposition research himself, something Rubio never bothered to do for his senate races or during his years in the Florida state legislature. Step #3: Rubio is offering up his own extremely watered down version of the DREAM Act as GOP cover for its opposition to a plethora of pro-Latino legislation while positioning himself as both a Republican leader on the issue and draping himself in a little pan-Latinoness. Rubio knows that while he can talk to white GOPers about his Hispanicness all day long, Latinos -- especially non-Cuban Latinos, i.e., the vast majority of Latinos in the U.S. -- know he’s been anything but an advocate for them. For example, failing to support both Sonia Sotomayor for the U.S. Supreme Court and the DREAM Act, while giving voice to legitimize Arizona’s draconian immigration law. Taking a leadership role on an immigration issue that’s directed exclusively at non-Cubans is designed to take on criticism that Rubio, who won his senate seat with only 40 percent of the vote, is not concerned about issues that affect Latinos outside of the unique perspective of Cuban-dominated Florida. 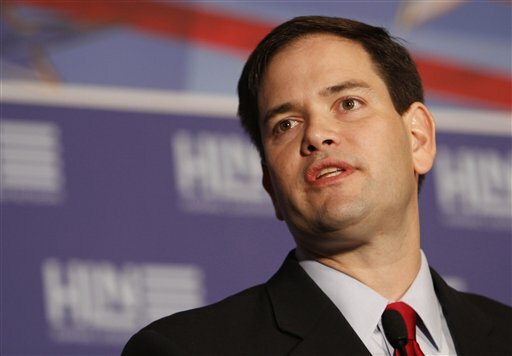 How would Rubio’s DREAM Act work? It would provide young people brought to the U.S. illegally as minors -- thus not having a say in their fate -- a non-immigrant visa. Not a student visa, not a worker’s permit, nothing that puts these kids on a path to permanent residency or citizenship. In other words, it would basically legalize them into a no man’s land for an unspecified period of time -- not unlike the same immigration nightmare his own grandfather went through almost 50 years ago.